By the last day of the trip, I had found my bearings, mastered the subway system, and gotten my first taste of Peking duck. I visited ancient temples, caught glimpses into everyday life, and enjoyed my deep exploration of the menu at my local dumpling shop. Still, this was barely even scratching the surface of the city. This last day would be very very different. Mrs. Fussy was done with her conference, and we had plans with CC and her family. They all live in Beijing, but CC spends some of her time in Albany, and the whole gang was eager to show us around their country. But an adventure of this nature cannot begin on an empty stomach. So first, we had breakfast. However, breakfast today would be a departure from my typical morning fare. Instead of visiting the dumpling shop, I accompanied Mrs. Fussy and her colleagues to the Beijing Breakfast Buffet at the hotel. It was an impressive spread, and it was very Chinese. But it was still hotel food. For example, they had fried dough sticks and hot soy milk, which is a combination I’ve grown to love. However, the crispy doughnuts were held in a chafing dish and took on the same character as buffet bacon—still good, just not as crisp as one might hope. On the plus side, there was a ton of variety, including sweet baked buns, steamed savory buns, and a congee bar. There was even some sauteed fish dish which wasn’t half bad. But mostly I sat there dunking my donuts into my soy milk and I was happy. Afterwards we met CC’s mom and dad at the hotel. Her parents didn’t really speak english, although her mom’s english was a million times better than my Chinese. 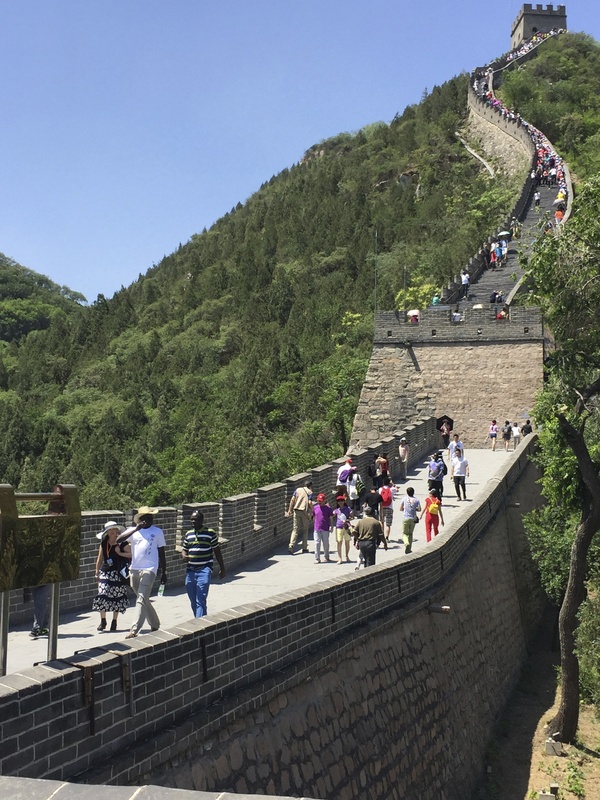 We all loaded into their car, and we were off to The Great Wall. That’s one big wall. Like Beijing, it’s impossibly big. And where we got onto the wall, at Juyongguan, you just keep on walking up and up and up and up endless steep staircases. It’s remarkable that more people don’t plummet to their deaths. Not off the wall, mind you. Just from falling down the stairs. Bravery has never been my strong suit, but terrifying is a pretty good word for it. CCs dad had no interest in climbing up the wall, so he took a nap in the car. Her mom packed a picnic lunch for us and a separate one for dad in the car. And after our epic climb, we found a place to sit and enjoyed some homemade cold sliced beef and slices of a famous northern Chinese sausage. I really hope to get that recipe for the cold sliced beef because that was delicious. We tuckered out too early to head straight to dinner, so we made a side trip to the Olympic Village. At the time Red Bull was sponsoring a live parkour tournament, and we watched a few of those contestants do death defying stunts from narrow ledges on high platforms. And it was wild to see the Bird Nest stadium up close. 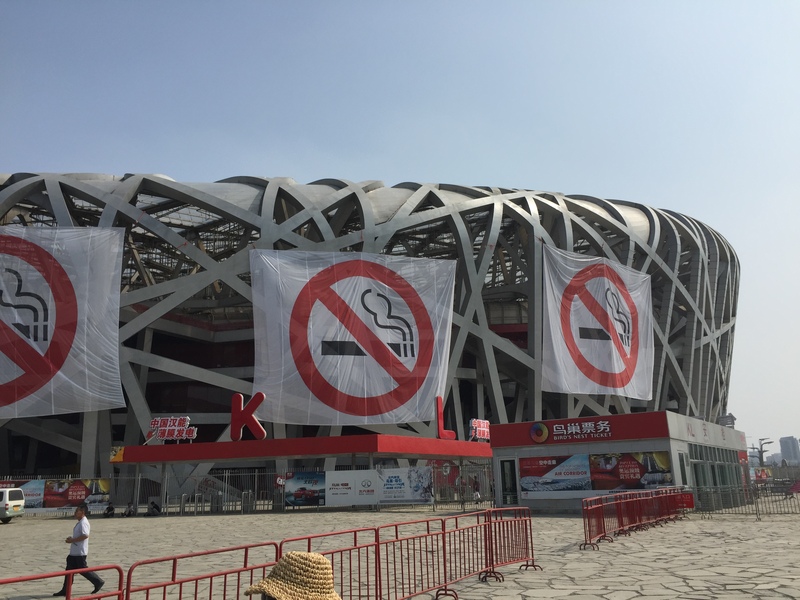 The building was decked out in no smoking signs, because apparently the city was outlawing public smoking as of June 1. We’ll see how that goes. Then it was off to Quanjude for another Peking duck. This time we would have more mouths to feed. Our plan was to treat our friends and tour guides to dinner, but they wouldn’t hear of it. The meal was amazing. It was everything I dreamed that a Peking duck dinner would be. We started with cold boiled duck liver, and cold duck feet with mustard sauce. There was duck tongue soup and tantalizing fried duck hearts. And then there was the main event of the duck itself. Once again we took hot crispy skin and dipped it in granulated sugar for the best meat candy on earth. And I probably made a spectacle of myself as I ate and ate and ate and ate. Here’s a tip. Never mention food while eating in China. We were talking about some of the things I ate, and some of the dishes that I missed out on during the trip. And I mentioned how I had hoped to find some more of Beijing’s boiled dumplings. Well, despite all the food on the table, CC’s dad went to find the waiter and ordered a round of duck heart dumplings. The good thing about boiled dumplings is they slide right down. Almost like dessert, they must go into a separate stomach. These were incredible and completely different from the flavor and texture of the fried duck hearts. And this was only a part of the food we ate that night. There was more, including the whole fish, and the shrimp, and the mushroom soup. Plus there was a plated dessert and the final round of fruit. Man. That. Was. A. Feast. All I can say is that when the family comes to visit CC in Albany, we’ll have to find some kind of equivalent gesture to return their hospitality. After dinner was a much needed walk. We went to the Dashilan shopping district and got the kids some souvenirs. I found a post card shop that also sold postage and wrote a note to my Nana (which should probably get to Long Island in a few more weeks). And as dusk fell we walked past Tiananmen, the National Museum of China, and the National Center for Performing Arts (Beijing’s very own egg). Exhausted, full, and with a cab scheduled to pick us up early in the morning, we went back to the hotel. But that next morning I decided to wake up extra early for one last visit to my dumpling shop. I bought enough for everyone leaving that morning to have breakfast. That was dumplings for five (which set me back about $6). It was a shockingly heavy amount of food. 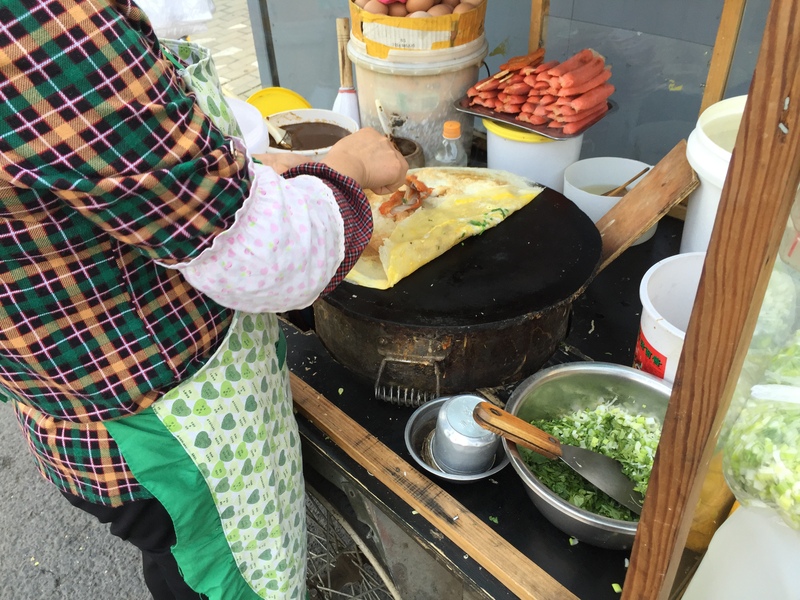 Despite my heavy load, I could not resist getting one of those street crepes that I found on day three. Jianbing is their name. And that was a real taste treat. Sure, that meant I could barely touch my dumplings, but no big deal. I took the bag on the plane with me and I was munching on them through the first half of the flight. It was a great way to end a great trip. And except for the noodles, and arguably two more Peking ducks, I was able to cram it all in. Thanks for the travelogue. We have visited Beijing twice and share similar experiences. Yes! Thanks so much for a great foodie recounting of your trip. I’m drooling.